So when journalist Chastity O'Neill returns to her hometown, she decides it's time to start working on some of those feminine wiles. Two tiny problems: #1--she's five feet eleven inches of rock-solid girl power, and #2--she's cursed with four alpha male older brothers. After reading All I Ever Wanted by Kristan Higgins, way back when.. I promised myself I would read more from this author. When I picked up my copy of Just One Of The Guys, and after reading it's synopsis I was sure this would be another WIN. But sadly it wasn't. I have mixed feelings towards this book really. The setting in a small town, independent girl Chasity bordering on her thirties, looking forward to settle down with someone she loves and a half hound-dog, half bull mastiff named Buttercup. BIG family, always an A+ in my book. Specially when she is the little sister of the clan. I know me and my siblings are very protective of our little brother :) So as I was saying BIG family with lots of nieces and nephews, great career and the only thing Chasity is missing right now is a husband and four kids. Yeah absolutely perfect for a contemporary romance theme. And so far I am in love with the entire thing. Now we come to the love life. In one side we have the fireman she had always loved since Chasity could understand the meaning of the word love. But he practically lives with his family sooo he was sortta like another son to her parents. And she doesn't want him to feel weird so they keep their distance but I swear there is something there. I am sure of it, and then in the other side we have the New York Times doctor with perfect cheekbones who just happens to waltz in Chasity's life. So who is the perfect suitor? Should be pretty clear right? WRONG! And I am still okay. Now is the time everything gets outta hand. Till almost end of the book everything seems to go somewhat smoothly with one of these 'suitors', and it was fine and dandy too, until ....until there was this triangle limbo. I like reading about a healthy love triangle like any other reader, but this was just twisted. I had no freaking clue who was suppose to be it for Chasity and it was just not that great like I hoped it would be. At the end I just have to say Just One Of The Guys was really disappointing, not comparing to Higgins' other work, but the triangle just put me off big time. 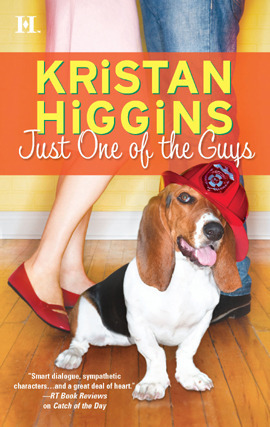 Miss Higgins has written lots of great books, in fact All I Ever Wanted was one of my cupcake worthy books. Kristan Higgins lives in a small Connecticut town with her two children and husband. She is a contemporary romance writer, she loves to write books about relationships, since the search for love and security is one of the driving forces of life. Hmm sounds like the end was a train wreck for you, I am wondering what derailed the train? Bummer that this wasn't better for you. Maybe next time. Thanks for the honest review!